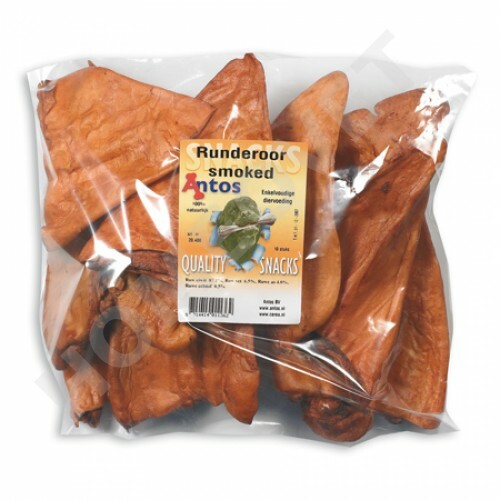 Slightly-smoked Cows Ears are 100% natural, low in odour, non greasy and lower in fat, cows ears are suitable for all medium and large dogs, but are chewy in texture unlike pigs ears that are hard and crunchy. Like many natural dog treats, the cows ears are air dried, additive free, with No added colours or preservatives, but also a healthy option when compared with other dog treats, including pigs ears as they are extremely low in fat. Cow ears make a great tasting dog chew that's low in fat, and, dogs can't get enough of them! Chewing action helps clean teeth to support dental health, by scraping away the plaque and tartar build. Give Cows Ears on a non-stainable surface and provide plenty of fresh drinking water!